NOAA Fisheries recently released its recovery plan for elkhorn coral (Acropora palmata) and staghorn coral (Acropora cervicornis), identifying criteria that must be met for these branching corals to be removed from the list of threatened species under the Endangered Species Act. Coral reefs are critical to the health of marine ecosystems and economically valuable to coastal communities around the world. They provide food and shelter for more than 25 percent of marine fish and up to two million marine species, protection for shorelines against effects of major storms and about $483 million annually to the U.S. economy through tourism and recreation, NOAA said. The new plan contains two dozen actions needed to recover the species, and it addresses research and monitoring, ways to reduce threats and enhance populations by growing corals in nurseries and putting them back onto the reef. 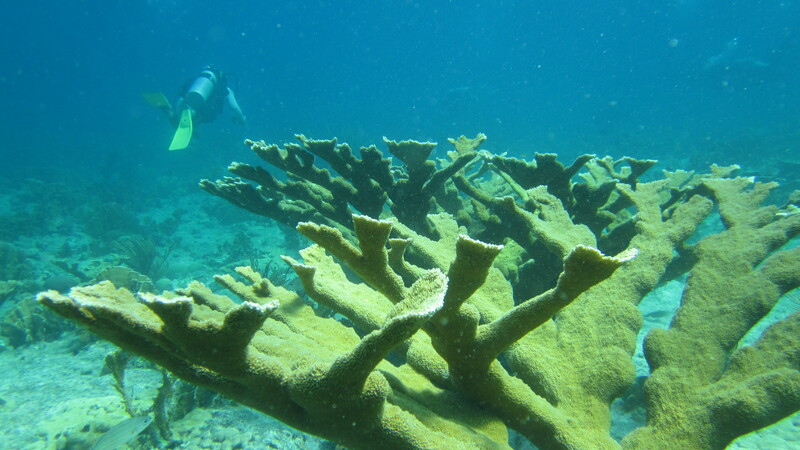 Scientists at Mote Marine Laboratory — an independent, nonprofit marine science institution with six Florida campuses from Sarasota to Key West — wrote portions of the staghorn and elkhorn coral recovery plan and conducted research that helped inform its recommendations. 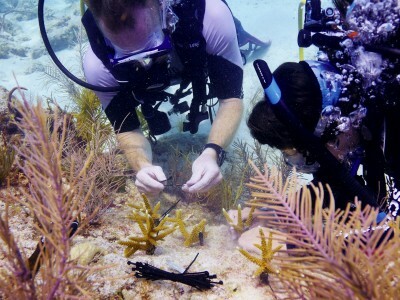 Mote, which announced exciting plans for expansion this year, is carrying out innovative coral science and restoration projects at its research facility on Summerland Key that are relevant to the recovery plan. Mote Senior Scientist Dr. Kim Ritchie is one of 19 expert authors for the recovery plan. Authors hail from government agencies, academic institutions and non-government organizations. Ritchie, Mote Research Program Manager for Marine Microbiology, studies the microscopic life associated with coral reefs, including beneficial bacteria that are part of the corals’ immune systems and the microscopic algae that give corals energy and color. She has worked with staghorn and elkhorn corals since 1992, studying the factors that can make them healthy or sick. 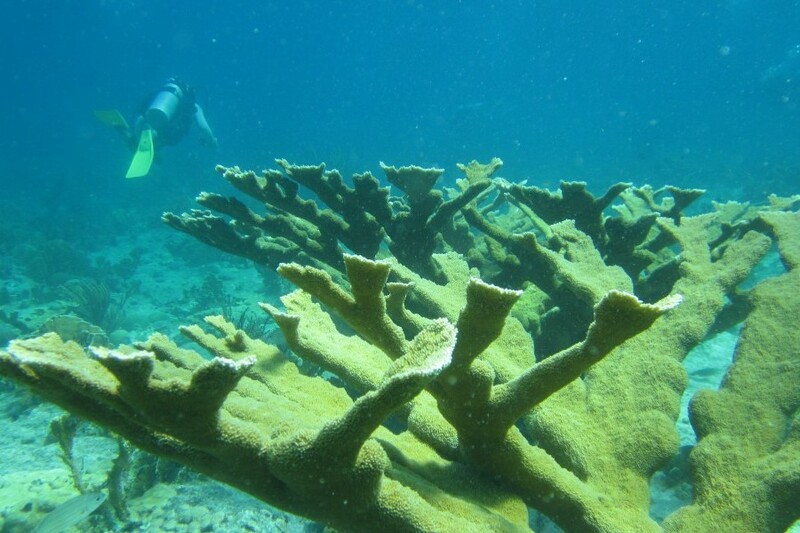 Staghorn coral and elkhorn corals have declined between 92 and 97 percent in the Caribbean since 1970, especially due to disease, temperature-induced bleaching and storms, according to NOAA. The corals’ future survival is threatened by climate change, ocean acidification — a harmful chemistry change that can make it harder for corals to build their hard skeletons — and further impacts from disease and other threats. However, many threats remain poorly understood. The NOAA recovery plan advises more research to better define and address several threats. Studies by several Mote scientists have provided some of the first glimpses of how multiple threats affect staghorn and elkhorn corals. In 2006, Ritchie published the first study showing that stress from warming water can leave elkhorn corals more susceptible to disease-causing bacteria. During a summer bleaching event, the elkhorn corals’ normal tenants — beneficial bacteria that produce antibiotics — were replaced by more harmful species. Today Ritchie continues to study the dynamic relationship between corals of the staghorn and elkhorn group, Acropora, and the microscopic life forms that can help or harm them. A 2008 report of research led by Mote Staff Scientist Dr. Erinn Muller demonstrated for the first time that elkhorn corals had more outbreaks of white pox disease during heat stress. The corals that bleached became likelier to die from the disease. In addition, a 2014 report of research led by Muller demonstrated for the first time that white pox was likelier to affect elkhorn corals not only if waters warmed, but also if the coral colonies were larger or more genetically susceptible. Dr. Emily Hall, Manager of Mote’s Ocean Acidification Program, is studying how ocean acidification affects coral growth and physiology. A team of Mote scientists recently received a grant from the National Science Foundation to significantly expand its ocean acidification research infrastructure in the Florida Keys. Muller and Hall have led preliminary studies with partners from around the world to better understand the combined effects of temperature change and ocean acidification on staghorn corals. They are currently studying which genetic types of staghorn coral fare best in acidic water — key knowledge for Mote scientists and others seeking to use the hardiest corals for reef restoration. For more than eight years, Mote has raised coral for restoration in its extensive underwater nursery offshore of its research facility on Summerland Key. There, scientists are growing threatened staghorn coral for replanting on decimated or damaged sections of the reef throughout the lower Florida Keys. Currently Mote is growing 4,250 colonies: some 70,000 fragments. Mote scientists plan to plant 6,000-10,000 fragments into the wild during the next year. In 2014, the Florida Fish and Wildlife Conservation Commission (FWC) announced that staghorn corals grown in Mote’s underwater nursery and later replanted by FWC researchers offshore of Marathon had spawned in the wild — an exciting development demonstrating that corals grown with Mote’s innovative technology in a nursery setting and later used to restore a reef can reproduce naturally. This means that restoration methods developed by Mote and its partners show great potential to give corals the boost they need to rebuild. In addition to staghorn coral, Mote is restoring several other species of brain, boulder, star and mounding coral that are vital for building reef structure, using innovative technology to grow these species as quickly as 25 times their normal rate. In February, Mote announced exciting new plans to expand its research facilities on Summerland Key, allowing the Lab to greatly increase its research, restoration and public education efforts benefiting coral reefs. The expansion will involve constructing an environmentally sustainable gold/platinum LEED-certified facility that will more than double Mote’s research and education space to more than 15,000 square feet. The expansion will allow Mote to significantly expand its coral research and restoration while hosting even more visiting scientists. The existing facilities on Summerland Key host visiting scientists from more than 60 institutions around the world each year. The expansion is a key priority of Mote’s newly announced comprehensive campaign: Oceans of Opportunity: The Campaign for Mote Marine Laboratory. The Gardener Foundation, a Sarasota-based private foundation, is helping Mote kick-off its Florida Keys expansion through the significant initial investment of $5.14 million given as a loan that will enable Mote to begin construction quickly while the comprehensive fundraising campaign is still under way. Now, Mote is seeking the pioneering donors who can help it create fully functioning laboratory, educational and residential spaces. To learn how you can become a part of Oceans of Opportunity: The Campaign for Mote Marine Laboratory and support the organization’s work in the Florida Keys, please contact Campaign Director Jennifer Vigne at 941-388-4441, ext. 393, or jvigne@mote.org.